The European Commission has fined Nike €12.5 million for banning traders from selling licensed merchandise to other countries within the EEA. This restriction concerned merchandising products of some of Europe's best-known football clubs and federations, for which Nike held the licence. Commissioner Margrethe Vestager, in charge of competition policy, said: "Football fans often cherish branded products from their favourite teams, such as jerseys or scarves. Nike prevented many of its licensees from selling these branded products in a different country leading to less choice and higher prices for consumers. This is illegal under EU antitrust rules. Today's decision makes sure that retailers and consumers can take full advantage of one of the main benefits of the Single Market: the ability to shop around Europe for a larger variety of products and for the best deals." Nike's core business is the design and sale of athletic footwear and apparel, including for football clubs and federations, which generally feature Nike's registered trademarks, such as its name or “Swoosh” logo. Other products, so-called “licensed merchandise”, only feature the brands of a football club or a federation, not Nike's trademarks. For these products, Nike acts as a licensor of IPRs that grants licences to third parties, who become entitled to manufacture and distribute those products. It is in the context of Nike's role as a licensor for the manufacture and distribution of these licensed merchandise products that the Commission is imposing a fine. 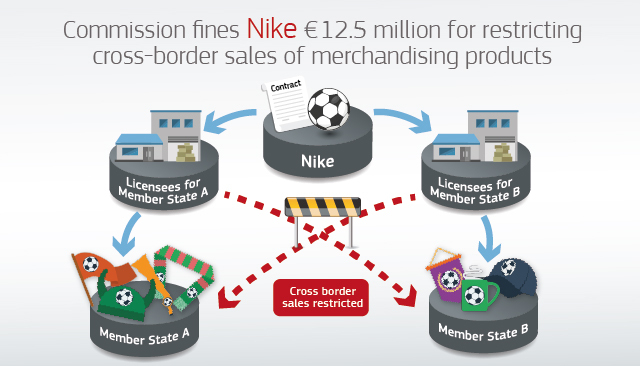 The Commission has concluded that Nike's illegal practices, which were in force for approximately 13 years (from 1 July 2004 until 27 October 2017), partitioned the Single Market and prevented licensees in Europe from selling products cross-border, to the ultimate detriment of European consumers. Nike's illegal practices affected to varying degrees the licensed merchandise products bearing the brands of clubs like FC Barcelona, Manchester United, Juventus, Inter Milan and AS Roma, as well as national federations like the French Football Federation. The fine was set on the basis of the Commission's 2006 Guidelines on fines (see press release and MEMO). Regarding the level of the fine, the Commission took into account, in particular, the value of sales relating to the infringement, the gravity of the infringement and its duration, as well as the fact that Nike cooperated with the Commission during the investigation. Fines imposed on companies found in breach of EU antitrust rules are paid into the general EU budget. This money is not earmarked for particular expenses, but Member States' contributions to the EU budget for the following year are reduced accordingly. The fines therefore help to finance the EU and reduce the burden for taxpayers. Nike's manufacturing and distribution agreements for merchandising products infringed Article 101 of the Treaty on the Functioning of the European Union (TFEU), which prohibits agreements between companies that prevent, restrict or distort competition within the EU's Single Market. More information on the investigation will be available on the Commission's competition website, in the public case register under the case number AT.40436. The Antitrust Damages Directive, which Member States had to transpose into their legal systems by 27 December 2016, makes it easier for victims of anti-competitive practices to obtain damages. More information on antitrust damages actions, including a practical guide on how to quantify antitrust harm, is available here. The Commission has set up a tool to make it easier for individuals to alert it about anti-competitive behaviour while maintaining their anonymity. The tool protects whistleblowers' anonymity through a specifically-designed encrypted messaging system that allows two way communications. The tool is accessible via this link.